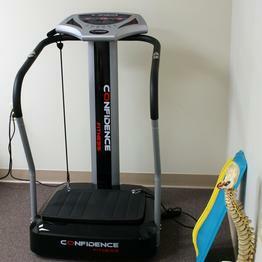 With Whole Body Vibration (WBV), you stand on a machine with a vibrating platform. As the machine vibrates, it transmits energy to your body, forcing your muscles to contract and relax dozens of times each second. 90% of the muscles contract as opposed to 40% with normal muscle contraction. Aids weight loss and fat burning. Improves flexibility and reduces back pain. Increases the number of functional red blood cells in the capillaries, but also increases the presence of white blood cells. WBV machines improve the delivery and removal of metabolic wastes in the blood by enhancing blood circulation. Waste products are removed more quickly and the body recovers more rapidly. Enhances blood and lymph flow. Reduces muscle soreness after exercise, build strength and decrease the stress hormone cortisol. Improves balance in older adults and reduces bone loss. Releases of HGH (Human Growth Hormone) leads directly and indirectly to a body shaping effect by a reduction in cellulite.